The ideal kit for cleaning and caring for your auto leather !! Keeping your auto leather clean & conditioned is essential to prolonging the lifespan of your leather . Auto leather is exposed to extreme hot and cold, this causes leather to dry out, crack and split. Eaz..y Care cleaning kits contain everything you require to stop this happening . There is no more effective and quicker way to look after your auto leather easy, quick & guaranteed to work. Beware of cheaper ineffective cleaning products .They hold little to no cleaning values and in some cases can damage your auto leather ! 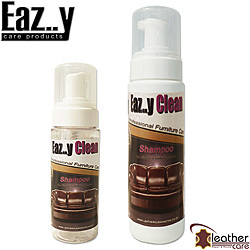 Eaz..y Clean Shampoo Auto 2. Maintaining auto leather is essential to prolong its life and will stop cracking and fading ! Applied in minutes, no rubbing in or waiting around for hours to dry. A complete kit to maintain and protect your cars leather. This handy kit is all you will require to look after your cars interior . Keep in your glove box and use as required . 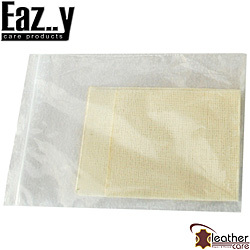 Eaz..y care auto products Guarantee total protection and the authentic aroma of genuine leathers. Caring for Suede or Nubuck can be tricky ! !! This kit gives you all you require to protect and maintain your Nubuck suite . Beware of cheaper ineffective cleaning products .They hold little to no cleaning values and in some cases can damage your leather ! 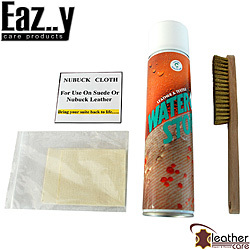 Eas..y care products Guarantee total protection For Suede and Nubuck leather. 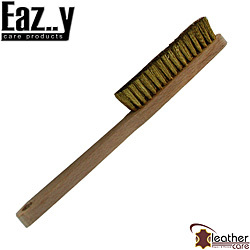 Eaz..y Pet has been developed to eliminate pet odours from leather furniture . 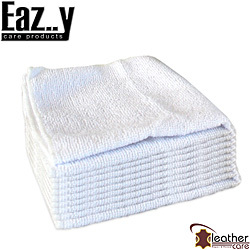 As with all Eaz..y Care products is covered with our 100% money back Guarantee !! 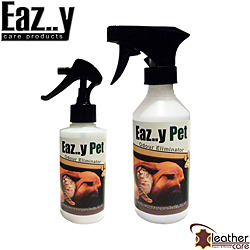 Simply spray Eaz..y Pet directly on to your leather furniture and eliminate pet smells for good !!!. Spray on Eaz..y Pet to a panel at a time, leave for around 60 seconds then gently wipe over with a clean cloth . You can use your suite when touch dry (approx 1 hr). No waiting around!!! Also works on Auto leather, Eliminates most odours and works effectively on mould especially on auto leather. Beware of cheaper DEODORISERS They often just mask smells and will not successfully eliminate pet odour. Always read the label prior to use. When ink has been allowed to dry in to your leather for 48 hours or more, it can prove very difficult to remove. For the best chance of removing ink that has been allowed to dry, without causing permanent damage to the leather surface try Ink removal gel. Ink Removal gel is a mild enough not to damage your leather, but strong enough to lift ink from the surface of leather. Warning, never attempt to use baby wipes or any spirit based removers (such as nail polish remover, white spirits etc) you could cause permanent damage to your leather. The ultimate care product for the metro-sexual male !! Man bag care has been designed to protect, condition and maintain even the toughest of leathers . Ideal for Smartphone cases, iPad covers, Laptop bags, Brief cases, wallets. Man bag care will keep your leather bag looking and feeling at its best GUARANTEED ultimate protection. Beware of cheaper ineffective care products. Multi use leather cleaning products, may not be suitable for fashion leather, always check the label prior to using! Ladies, we all know how much you love your handbags and you want to keep them looking and feeling great !! It's never been easier to keep your bag looking new. This fantastic 2 stage kit will maintain and protect your leather handbag against not only the elements but everyday wear and tear. An essential part of owning a leather handbag is to keep it conditioned and protected . Handbag care is GUARANTEED to give you piece of mind and complete protection . Simply spray the foam on and let it go to work, no scrubbing no rubbing , leave for up to 60 seconds, and simply wipe of with a clean cloth. It's so simple, so effective and so quick! Always read the directions before use. 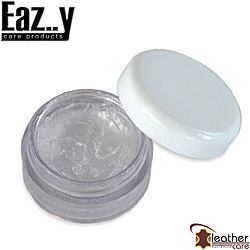 Eas..y Care Dye Remover is designed to deal with the toughest marks caused by denim and pen marks. Remove them with Eas..y Care Dye Remover, Guaranteed to get the job done. The complete dye removal solution, no need to cover up those embarrassing marks and patches of dye or oil. 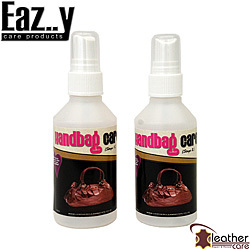 Used in conjunction with Eaz..y care products your leather will always look and feel NEW. Maintains the moisture balance n your leather, essential to keeping your leather healthy and looking and feeling good ! 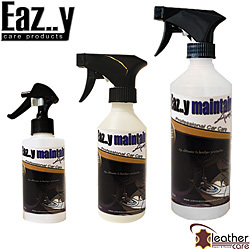 Eaz..y maintain is a fantastic maintenance product, designed to hold the moisture balance in your leather, preventing cracking and splitting .